Until now, filming underwater has required teams of divers and expensive underwater camera rigs - but a new iPad-controlled robot does the lot itself. The battery-powered Aquabotix Hydroview shoots in Full HD and swims independently, letting users see through its eyes with an app that works on iPads, smartphones and Windows laptops. The $4,000 machine comes with a 75-foot cable and battery pack that lets it 'swim' for three hours - its makers suggest the tiny submarine could be used to find lost keys underwater, or for underwater documentaries. 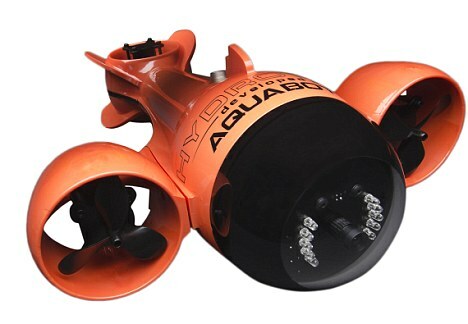 Complete with on-board LED lights for underwater, the HydroView travels at up to five knots forward and one knot in reverse while shooting video or capturing still images at depths up to 150 feet down. It can also capture information on water conditions. The Hydroview costs $4,000 - more prosaically, you can also 'explore the depths' with a camera mounted on a boat hook for just $475. The HydroView communicates wirelessly from the user’s handheld device to the HydroView’s top-side box, which is in-turn connected to the submersible via a cable tether.